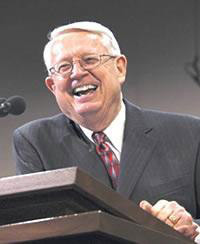 After five decades of biblical teaching and preaching, Charles R. Swindoll’s name is second only to Billy Graham as the most influential living preacher, according to pastors surveyed in 2009. The author of dozens of bestsellers, Chuck is known for his biblical insight, practical teaching, and hearty laugh. He and his wife Cynthia have four grown children and ten grandchildren. In this interview Chuck talks with our editor Phil Callaway about “worship wars,” tough times, regrets, and a hill worth dying on. Chuck: Hey Phil, how are you? You’re looking well. Phil: You’re looking good yourself. Chuck: I’m here in Dallas , just trying to make ends meet. You know how that goes. I thought about you the other day when I was listening to a station called “Clean Comedy” on my car radio. Really funny stuff! I keep waiting to hear your voice. Phil: I’ll be on there one of these days. Phil: I repeated a joke to someone the other day. My mom took me on the bus when I was a baby and the driver said, “That’s the ugliest baby I’ve ever seen. Go to the back of the bus.” So she did and told a passenger beside her that the driver had been really rude. And he said, “You know, you need to go up there and confront that driver. And while you do, I’ll hold your monkey.” But I’ve gotten better looking as you pointed out. I’m so glad. Chuck: How old are you now, Phil? Chuck: Good for you. Are you worried about next year? Phil: I don’t think so. Should I be? Chuck: Did you break anything? Phil: Just some rules of common sense and a bunch of ribs. Plus I got a gash on the head. I thought about you as I was preparing for this interview because I know you’ve been out on the Harley occasionally. Are you still doing that? Chuck: No, I’ve sold it. My son and I were partners and would ride together. I’m not a big group rider but we rode together for 12 or 13 years. And one day he said to me, “You know, Dad, I’ve got little kids and I get nervous at intersections,” and I said, “Sell the bike.” So he sold his and I realized about a year later that it was no fun doing it alone so I sold mine too. But we had a great time and it was something that brought us back together. Our mutual friend Ben Lowell [Director of Insight For Living Canada] is now into it. Phil: Yeah, I was just with him the other day and he had all the gear on even though he wasn’t riding—he’s that excited. But we’ll pray for him. I think he sleeps on his bike on occasion. Chuck: He’ll get over it. Phil: Listen, I am very glad that you agreed to do this. Servant goes into about 110 countries, primarily the US and Canada. I just wanted to thank you, Chuck, for your impact on my life. When my wife and I were first married we began reading Growing Strong in the Seasons of Life and I don’t know that this is what you intended, but aside from just a very practical look at God’s Word, you showed us that faith is not stuffy; it is exciting, it is relevant, it’s filled with joy. Would you still say that after all these years? Chuck: Yeah, I certainly would, maybe now more than ever. I do meet a lot of grim and heartless folks—they’ve lost their heart for life. I know times are hard. Cynthia and I came to the realization the other day: it’s always been hard. It was hard for my parents, married in the Depression, had their kids during the Depression and shortly after that World War II happened. Boy, that was hard. And then the Cold War. And then teenagers. Now you’ve got to seriously go to school and then the military. And then for me, finding out you’re called to the ministry—that’s hard. You’ve got to go through seminary—that’s hard. It’s always hard. You never have enough money. God doesn’t do sky-writing so you have to trust Him by faith. You have to go with what He gives you and let Him guide you and listen to His reproofs and love one another and all that goes with that. It’s always difficult—always. So we’ve learned that since times are difficult there’s no reason why we ought to make it more difficult. We ought to spread some joy. We ought to take God very seriously, but not ourselves all that seriously. Phil: Well, you’ve been criticized for that, for laughing too much. Chuck: Oh, I know. That’s what makes it exciting. Phil: Was that hard at first? Chuck: I like Churchill’s comment: “Nothing in life is more exhilarating than being shot at without results.” A lot of folks want you to be as miserable as they are. I’m not getting on that bus. Phil: How do you respond to criticism? Chuck: You know, Phil, it still isn’t fun. I can make light of it, but it hurts. It stings. I think the price you pay for that is that you’re sensitive. Pastors who are worth their salt, care. If you don’t care then nothing affects you and you’re like a piece of steel. But who wants a minister who’s a ball bearing? But if you care, those jabs hurt. And you often want to stand up and say, “Wait, wait—if I could just have three minutes I could explain what I meant!” But you never get those three minutes. I mean this the right way, please, but yes, you get to where the older you get, the more confident you are in what you really do believe. When I was younger I ‘died’ for many things. Now that I’m older there just aren’t many things I’d die for. But I’d die quicker now because I know they’re worth dying for. Before I had answers to questions nobody was asking. Now I think through my answers and I’m pretty confident. I have convictions now; I don’t just have beliefs. Phil: You have waited awhile to do this book, The Church Awakening. Is this a hill you’re willing to die on? Phil: And you feel that’s where we are right now in the church? Phil: You tell early in the book how your grandfather measured the erosion of a cliff near his cabin when you were a boy and the need for churches to measure where they are on that erosion scale. How can we measure that? Chuck: Well, first of all, we have a book of directions, so let’s just take the New Testament. If you want to, just the letters of Paul, and go to those letters that address the church, like Timothy and Titus, and make a serious study of what they say. How are we doing? Are we carrying out the assignment set forth in this timeless, true book? If the answer is no, then where are we off? Then let’s do a course correction. We had to in our church. We had the wrong elders so we had to dismiss some. Was that easy? Hardest thing I’ve done in my life, Phil. They hate me today. They’ll never understand why I did it. I tried to explain it. But we were moving in the wrong direction. Part of it was my fault because I let it go on too long. Much of it was their fault because they really didn’t have a heart for what Scripture taught. They wanted to run it like a business. Phil: How did you recognize that at the time? Chuck: Oh man, by things they would say. And I began to feel more and more like a figurehead. They wanted me to come and preach, not come to the study at the church. They’d run the church like a business, they’d hire and fire. I’d show up and I’d say, “Why to you want me to do that?” And they’d say, “Well, because you bring in the crowd and the money.” And I finally had to say, “Stop. Do you know what you just said?” And they said, “Yes, that’s exactly what we meant.” And I realized then that I’d been too far removed. I was trying to run the seminary, trying to handle several things that were like forest fires, I was writing three books, I was all involved in starting a church and I just thought, They’re good guys, let them take care of it. And I realized—we are moving south. We’re not moving north on this. This is wrong. So I acknowledged it and I said to them, “I cannot work with you. It’s either you or me.” I’d never done that in my life. Never. And I hope never again to do that. And I said, “I take full responsibility because I voted for you guys to be here. I was wrong. We’re going to do this biblically. We’re going to do this right.” The salvation is that it never got to the congregation. I’m telling you more than the vast majority of our congregation ever knew. It never got there, thank goodness, or we would have split the church. Phil: So you’re very much for not spilling these things in front of a congregation? Chuck: I don’t think you should. Whatever you can handle—it’s like discipline. I think very, very seldom do you do public discipline of somebody. It can usually be handled behind the scenes very effectively and without the embarrassment that goes with that. You’re trying to reconcile; you’re trying to get the person restored. You’re not trying to send them to ‘prison’ for the rest of their lives. Sometimes, of course, it does have go public. I told those men, if you fight me on this and tell me I’m through, I want you to know I’ve got one more Sunday and I’ll expose every bit of this and you have my word on that. Phil: And they backed off? Chuck: They did and they left. And of course they called me a bully and all that. I wish it had never come to that. I wish they had agreed on their own that they weren’t moving in the direction we wanted to go, that I was that pastor and we all wanted God to be honored. But they saw it as a hostile takeover on my part. Phil: I think you said in the book that was the most difficult season for you in five decades of ministry. Chuck: That’s exactly true. I still bring it up at times and it’s a nightmare. Two nights ago I dreamed it and I got up at 2:30 in the morning shaking. It’s the worst thing I’ve ever gone through. Phil: What got you through that time? Chuck: That’s a great question. A magnificent wife who was with me all the way. A handful of very close friends, several of whom were not connected to the church. A body of praying individuals, my extended family, my sister and a few of her friends who knew the depth of what it was. Only Cynthia knows how deep it was. But you see, if I ever go down for anything in my legacy, it will be saving the life of Stonebrier Community Church . I think I did that and I’m more grateful for that than any book I’ve ever written, any sermon I’ve ever preached. I’m grateful that I decided, today is the day. That’s it. I’m not looking the other way any longer. We’re going to turn this thing around. And we did. And the joy we have now is beyond measure. Chuck: You know, when you cut out the tumor and you go through the radiation and you get rid of all those cells, you have help and relief and sleep at night and joyful days and harmony. And you also have a big bag of wisdom you strap to your back and you draw from every once in awhile. Phil: Just this morning I was reading your chapter on worship and that’s how I would describe it. You said, “When the Bible loses its central place in the church’s worship, even if good things replace it, the fallout is biblical ignorance. What are some of those good things? Chuck: Number one would be the benefit that comes from being informed of the truth. Nothing equips you to deal with the cults of our day, superstition, fears, nothing equips you like truth. So you get the truth. Second, your focus is right; it’s on the kingdom of God and His righteousness. You want that more than anything. Third, you get your image out of it. It’s not about you. You’re not the one that’s important here. This is Christ’s church. He’s the head. You’re a member of the body. There’s one head and you get that straight. Next I would name priorities. You begin to figure out the more important things that are to take the place of the less important. And the important things then replace the urgent. There’s a little book that came out years ago called The Tyranny of the Urgent. The urgent always gets your attention. And the important always takes a back seat and you spend your time putting out fires and the important keeps waiting for you to deal with it. And I think by putting worship in its proper place you gain a right sense of priorities so it’s the filter through which everything passes. My music man and I get together and he and I go over the music for the following Sunday and I’ll say, “Okay, does it glorify God?” “Yes.” “Is this soloist really prepared so that our hearts are turned toward the living God?” “Yes, she is.” “Is this orchestral piece something that is going to turn people’s attention heavenward?” “Yes, it is.” Or, “You know, I’m not sure.” “If you’re not sure, then let’s not do it. Let’s only do what we know will honor Christ.” But filtering it through that, I tell you, it’s amazing what that does to your ministry. And you no longer have any celebrities. Soloists don’t show up to sing at your church because you’ve got a big church. We don’t do that. They come and worship with us, but we’re not here to showcase their talents. We’re here to worship God. We’re not here because Swindoll is here. We’re here because Christ is here. I happen to be along with you and when you come you bring the church with you. We’re in this together and we even have times of silence. I think when we fill every space up with talk and sound and music and stuff like that, we sometimes just need silence. Phil: What would you say to people in the pew who are recognizing an erosion in their church? Chuck: I have a good friend who is in that position right now. For 21 years he was in a church that was doing it right and now he’s watching the erosion. I’ll level with you, Phil. I’d say you’ve got to talk to people who can make the decisions to bring about a change. If you don’t get anywhere, learn a lesson from Luther who thought he could clean up the Roman Catholic Church. Finally they excommunicated him because he called a spade a spade. But you know what? He couldn’t continue on in that church. So I have to say to some, if you’re in a church where Christ isn’t being exalted and His Word isn’t being taught and truth isn’t taking first place and worship isn’t meaningful and it’s not going to change, you’re in the wrong church. The tragedy is that in some places there isn’t another church to turn to. Hopefully this book will help say, “ou know, folks, it’s never too late to start doing what is right.” So as a pastor you can start by saying, “This Sunday morning I stand before you a broken but an honest man to say, ‘I have not been leading this church as I should have and I acknowledge it and I repent before God. I want all of you to know that’s going to change. I need your prayers, I need your patience, I need courage, I need a team of people around me who will go with me through this. But I want all of you to know we’re no longer going to erode. We’re going to turn this around and here’s why.’” And I would spell out the reasons. If he needs to quote from my book, fine. But go somewhere to say on the basis of this, “This is the direction I’m going to take our church. Tell me now if that’s not where you want to go. If it’s not, I won’t hang around. I won’t make a scene; I’m gone. I’m going to find a place where we can do it right.” I have the feeling, Phil, that church would stand and applaud that man. Now, some would leave because they want to be entertained. That’s okay. There are lots of places that will entertain you. But I’ve found this, when I do have that cancer in my stomach, I don’t need entertainment. I need somebody who will say, “Come here. I’m going to love you through this because I care about you even if you can’t swallow your food. I’m right here for you.” That’s Christ-likeness. Phil: You have been in ministry five decades, which makes you 54 years of age, Chuck, by my math—I’m not real good at math. Phil: What is something you wish you had done sooner? Chuck: I’ll tell you something negative and something positive. It’s the first time I’ve been asked that in a long time. First, the negative. I would have cared less about what people thought or said. With that I would have cared more what Scripture said. Positively, I would have been a better husband and father. I’d have been better at home. Chuck: I’d have been there more. I’d have been more understanding, more forgiving, less demanding. I would have loved them into righteousness. I would have told them how much they meant to me earlier. I tell them often now. But I’d have built a bridge back to my younger son. Both of our daughters have been through tragic divorces. I don’t know where I figure in any of that—maybe I don’t. But every parent feels like maybe I could have said or done something that helped. But sometimes divorce can’t be helped and it’s how you survive. If I had been closer, would they have talked to me more? I would have been a better husband during seminary, a better father when they were little. Phil: I had the honor of being in Toronto last summer with you and your lovely wife Cynthia. Where would you be without her? Chuck: I can’t stand that thought. I’ve thought about it and I don’t know what would happen. Every day of my life we’re connecting. Every morning over coffee, every evening we’re talking. Our lives are so intertwined. And now that we do ministry together, it’s like one breathes in, the other breathes out. I sang in a quartet years ago and we sang together so long and so often that we knew when the other guy needed a breath. We used to talk about that. I sang first tenor and I always knew when the second tenor needed a breath and we would all pause and let him breathe and then we’d go on. That’s kind of the way my relationship is with Cynthia. Phil: Well, you’ve been a tremendous example to Ramona and me. I thank you for that. Chuck: You give her my love, and you love her—do you hear me? I know you’re the big deal and it’s easy for you to forget that you’re just Phil and she really needs you, man. Phil: One more question: what would you like on your tombstone? What would you like to be remembered for? You mentioned Stonebrier Church. Anything else? Chuck: I probably wouldn’t want to put that in granite. That’s hard to answer. Phil: Not a fair question? Chuck: It’s a good question. I think, “He exercised the gifts God gave him and he did it for God’s glory.” Maybe that would be it. I have a friend who said he would put on his tombstone: I told you I was sick. Phil: I saw one: Here lies an atheist; all dressed up and no place to go. Chuck: [laughs] I love you, buddy. Phil: You too. God bless. Read more of Phil's Interviews. Like to see Phil's humor articles syndicated in your magazine or newspaper? Email us for info. ©2012 Phil Callaway. Read more of Phil's articles.